Usually, when I prove results about fitness landscapes, I like to focus on the unintuitive subtlety and complexity that hides in high-dimensional spaces. You can catch me in many a Slack channel berating people for drawing simple 2D or 3D representations of fitness landscapes as mountain ranges (instead of high-dimensional mazes). So, of course, that is exactly the piece of hypocrisy I’ll engage in this post: drawing a 2D fitness landscape. It is simply the best tool for the job in this illustration. However, if we must interpret it within a framework of high-dimensional spaces, we can see it as a 1D cut through that space, or as the average over paths of various Hamming distance from a given point. The details will not be essential. Let’s imagine a genotype (or phenotype) space with 9 types: T, U, V, W, A, B, C, D, E and a notion of locality (i.e. mutational nearness) such that adjacent letters in the previous list are adjacent in the mutation network. Associate each of the 9 types with a fitness value (given by the solid line in the figure at left). Finally, suppose that evolution prior to treatment has taken our cells to the cancerous state W (for wild-type) which has fitness 6. I have chosen the landscape such that W is a local maximum that is separated by a valley from a higher local maximum at D. This will be our DMSO fitness landscape. Now, if we wanted to look at treatment, the default seems to be to generate another fresh fitness landscape for the drug on the same space of types. This seems a bit unreasonable to me, and not a workable approach in the long-term for predicting drug’s fitness landscapes. In particular, if we fully embrace this approach then our only option will be to measure the landscape for each new drug. An alternative is to try to build a simple theory of how drug transforms a DMSO fitness landscape. After all, the fitness of a cell in drug is not completely unrelated to its fitness outside of drug, since the drug affects only certain pathways of the many that determine fitness. This is in keeping with theories that view compact representations of fitness landscapes as descriptions of genotype-phenotype maps. In this way, we can see a drug as affecting some but not all of the interactions in the phenotype that lead to the cell’s fitness. Now, in practice, this transformation of a fitness landscape (or its compact representation) due to drug could be incredibly difficult to measure. And, again in practice, we would only learn what these transformations are like by first measuring many DMSO and in-drug fitness landscapes. But the hope is that a pattern would fall out. An even more ambitious hope, maybe shared by some in developmental biology, is that we could learn the way compact representations of fitness landscapes are encoded and decoded by nature and then use biochemical analysis of the drugs to see how they’d effect the fitness. Until then, as is common in the theory-heavy and experiment-poor fitness landscape literature, I think it is reasonable to make some educated guesses at how our toy landscapes will transform. Note that we already do this when making theoretical claims about how different treatments transform games (instead of, but closely related to, fitness landscapes). As a simple caricature, let f be the strength of our chemo: when a cell tries to undergo mitosis, it will be killed with probability f. This means that at f = 0.5, there will be no growth in the affected population, since half the time that a cell tries to divide, it succeeds and becomes two cells and half the time it dies and becomes 0 cells. For 0 < f < 0.5, the growth rate is slowed; and for 0.5 < f < 1 the growth rate is reversed. In terms of a fitness landscape, a strong (f > 0.5) chemotherapy of the above kind would look like a mirror of the landscape through some constant fitness line. So in the case of our toy-model, we can consider something like the dashed line in the left-hand part of the below figure. Notice that it turns hills into valleys and valleys into hills. In particular, it destabilizes the fitness peak of W making it into the bottom of a valley. Now, imagine that chemo is applied and it transforms the fitness landscape from solid to dashed. The ideal situation is that the resulting drop in fitness (from 6 to -1 in our example) produces such a rapid decrease in the tumour’s size that the cancer cells are all killed before a resistant mutant can emerge. But suppose this ideal situation doesn’t happen and cells arise that mutated to type A and eventually even B. For an example dynamic, see the right-hand figure above: in red we see the evolution of the resistant cell line, with its (hypothetical) DMSO fitness in solid and drug-fitness in dashed lines. Note that the later genotypes have higher fitness than W in drug and maybe high enough to no longer be controlled by therapy. At this point, both the clinician and biologist would consider the type B cells as resistant. In particular, due to the definition of chemo, the local fitness peak of the drug landscape correspond to local fitness valleys of the DMSO landscape. Thus, in DMSO type B has a lower fitness than type W: 4 versus 6. And as such, we can associate the benefit of type B in drug with a cost of 2 in DMSO. This is what we would expect from a standard cost of resistance model. In terms of reading the figure at right, we can see the amount of benefit that resistance provides by looking at how much higher the dashed red line is above the dashed black line (wild type fitness in drug). The cost can be read as the difference between the solid black line (wild type fitness in DMSO) and the solid red line. But how should our models of targetted therapy differ from chemo? I think that the key term here is ‘targetted’. Whereas chemo was a mirror image of all fitness points, I think that targetted therapy should be seen as a depression of particular genotypes (the target) and those nearby. I show this in the dashed line of the figure below left. Targetted therapy greatly decreases the fitness of W, from 6 all the way to -3 (compared to just – 1 for chemo) and also nearby mutants types like V and A, although it affects them less than W (taking both down to just 1, a decrease of 4 compared to W’s decrease of 9). Most importantly, it leaves genotypes further out unaffected. This seems to capture the goal of targetted therapy: hit only the bad genotype associated with a particular cancer. Notice that this has transformed the local peak around W into a really deep fitness valley. And unlike the chemo landscape, the top of this valley leads us to our old DMSO landscape. Thus, after climbing to B, the tumour can continue climbing to the higher fitness peak at D. Cost of resistance becomes a question of timing. A potential evolution of the tumour is summarized, as before, on the right hand side of the above figure in red. Note that the dashed and solid red lines merge together after time = 2. If the patient relapses while the majority of the tumour is still at type B (time = 2), then comparing the resistant tumour versus wildtype will produce a cost of resistance in DMSO of the same type as with my chemo example. However, if the patient relapses when the tumour has evolved to type C (time = 3) or D (time >= 4), then we will see either no cost of resistance (type C) or a negative cost of resistance (type D: fitness 8 in DMSO versus 6 for wildtype W). In other words, by transforming a local hill into a valley, the targetted therapy inadvertently eliminated the fitess valley that allowed evolution to keep W from advacing to D. With the therapy eliminating that evolutionary barier, the tumour can evolve a form of clinical resistance that is a more aggressive tumour all around. Of course, this is all based on theoretical caricatures of fitness landscapes that were designed to illustrate the point. If real world landscapes do not resemble these caricatures at all then this is not a danger that will become actualized. But until we are sure of this, it is a nice mechanism to keep in mind for understanding differences in resistance between chemotherapy and tageted therapy. For any of my clinical readers, I am especially curious on your experience if post-relapse tumours are all around more aggressive and quicker growing that pre-treatment tumours. A naive reading of cost-of-resistant would place them as less aggressive, but my impression was that clinically the opposite is seen: the post-relapse tumour is all around more aggressive than the original (even outside drug). If that is the case, how do clinicians currently make sense of this? Those are the empirical questions, but there is also plenty of fun theory that could be done. In future posts, I’ll consider a fitness landscape subject to a full ultimate constraint and thus not at a local peak prior to treatment; and also consider treatment strategies that include drug holidays or adaptive therapy. I hope all of this interests you, dear reader. And if you’ve read something like this already then please point me to the source. I don’t know personally, but I think this increased aggressiveness is quite common to see, clinicians often talk about it. IMO it doesn’t make much sense if one assumes that a single change is responsible for resistance (assuming aggressiveness is proportional to fitness, which in some cases is true I think). It seems that in your (non-targeted) chemo landscape that cells become resistant by slowing proliferation, is that the case? I think this is a reasonable assumption at first, but eventually “true” resistant cells evolve, using other mechanisms like MDR1 overexpression. I’ve heard clinicians talk about increased aggressiveness too and so I have a similar intuition to you. But I’ve not actually read literature on this, so I am worried that I might have something in mind that doesn’t match what clinicians have in mind. Have you seen any surveys on this? My two landscapes were chosen as two extremes: a global transformation like a mirror image and a local transformation of a targetted depression. Neither one of these matches chemo nor targetted therapy well, but they are each meant to resemble one more than the other. They also don’t exhaust all the main qualitatively different kinds of transformations. For example, one might want an ideal drug that just depresses every fitness point (except the healthy cell) by the same amount (instead of mirroring them). This wouldn’t change the topology of the landscape but could transform all viable cancer cells into non-viable ones without introducing new escape routes. But if we had such a drug then we wouldn’t really be worrying so much about the evolution of resistance, eh? As you point out, the easiest way to make chemo match this global mirror story is to make everything be about the proliferation rate. But, of course, in reality, many more components play into fitness than just proliferation rate and so the actual chemo landscape would not be a mirror. And the actual targetted fitness landscape probably wouldn’t be just a single depression. It would certainly be interesting to write down a few dimensions (proliferation, MDR1 expression, eflux pumps, etc) and imagine what a hypothetical landscape transformation would like along all those different dimensions. But I don’t think this is necessary for purely illustrative purposes. After all, I’m not trying to claim that negative cost resistance can’t occur for chemotherapy, I was just trying to imagine a model that is vaguely reasonable from which you could easily draw the common conclusion of costly resistance (and I suggestively decided to call it ‘chemo’ due to a vague resemblance). Wouldn’t tumors evolve regardless of the landscape? It’s not clear to me how often a tumor cell is negatively affected by more fit neighbors. I don’t understand your question and statement. Are we talking about the same thing when we say fitness landscape? 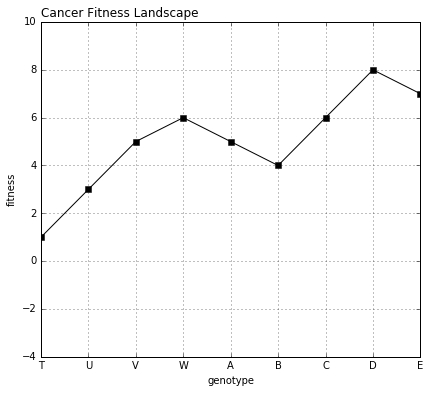 For me, the points in the fitness landscape are possible genotypes (not spatial positions) and the neighbours of a given genotype are the other genotypes that differ from it in a single (or in a small number of) mutation. A population is distributed over the fitness landscape and as the more fit types contribute more to future generations that the less fit types, the population evolves towards the fitter points in the fitness landscape. For ease of discussion, sometimes we represent the population by a representative agent (let’s say the most common tumour subtype) that occupies a single point in the fitness landscape, in that case we say the population is evolving if that most common subtype changes. Usually, this is happening by ‘moving uphill’ on the fitness landscape. In this way, the population is ‘negative affected’ by the higher fitness subtypes in that the population is more likely to move to those higher fitness subtypes thus having less representation of the lower fitness subtypes. Of course, if all subtypes have high fitness then it could be we are ‘evolving away’ from a lower (but still above replacement rate) fitness mutant while its actual population count continues to increase. Is that what you meant? Replying to your correction, but at one level lower in nesting (to avoid too much indentation). Presumably, we wouldn’t call a therapy as ‘working’ if it didn’t reduce the tumour burden at least initially. Thus sensitive cells would have a negative growth rate. Although this might be an artefact of how we approve cancer drugs, since it is possible to imagine addressing the symptoms of cancer without destroying the tumour (see footnote 1 of this post, for example) — but I digress. As for resistant cells having a positive growth rate in the presence of drug: this is exactly the definition of resistance. So I don’t really understand your point of “it would undermine the “cost of resistance” example”. Cost of resistance is defined as the resistant cells having a lower fitness than the sensitive cells outside of treatment; under treatment, resistant cells have higher fitness than sensitive cells by definition. And resistant cells having a positive growth rate in all conditions is actually not a complete curse if resistance is costly (obviously it is a complete curse if resistance is costless or negative cost, hence my questions about negative cost). At least, if we are given some extra factors like epigenetic loss of resistance outside treatment or spatial structure then you can still potentially do things like adaptive therapy for managing disease. Sorry I didn’t get the point across properly. In your example, I think your argument for cost of resistance is that treatment might result in more cells of genotype D. It is not clear to me why this is true. By reducing the number of cells of genotype W, you are not automatically increasing cells of genotype D (since D may not have been hindered at all by the presence of W). Often evolutionary pressure is driven by competition for resources or by conflict, which are not necessarily present here. Ahh, okay! I think I understand your point now and I think you are right. I was just too dense to get it at first. Thank you for taking the time to explain it to me. Let me say a variant of it back at you in my own words to make sure I understood what you’re saying. Let’s look at the chemotherapy figure (or the targeted therapy figure, or for any dashed landscape we might draw; but let’s focus on chemo), if B-dashed is high enough fitness to cause relapse (i.e. positive growth rate) then B-solid is also positive growth rate (since it is above B-dashed) and so A-solid is also positive growth rate (since it is above B-solid). Thus, if an A-mutant arose by chance from the W population, even in untreated condition (i.e. solid), then under a pure exponential growth model, it would continue growing in absolute number (albeit at a lower rate that W-solid, so shrinking in frequency) and eventually, that would create another mutation opportunity for B-solid mutant, etc. And that population would also expand in total number until eventually they created C-solid and D-solid mutants who would have not only a positive growth rate (thus expanding in absolute number) but also a larger relative growth rate (this expanding in frequency, too). The above is true in the exponential growth model, and that can be a reasonable model in many cancer settings. You are right that we need to couple the various subtypes to each other through some sort of struggle for existence (otherwise they won’t even be a Millsteinian population, anyways) to get anything interesting. So I would need to at least introduce something like a common carrying capacity (or some other limiting resource model) to ‘hold’ the absolute population (as opposed to just frequencies) at a local peak. Right! Interested to see what you find if you pursue this.